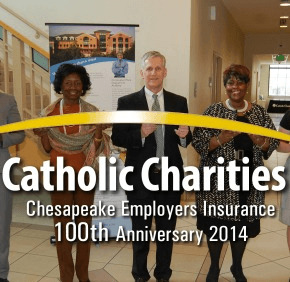 When Chesapeake Employers’ Insurance Company celebrated its birthday, several Catholic organizations looked forward to receiving presents. To mark its 100th anniversary, Chesapeake Employers committed to providing a total of $115,000 to 23 Maryland nonprofits that help develop the employability of their clients. Among the awardees were the Caroline Center, Catholic Charities of Baltimore and Cristo Rey Jesuit High School, receiving $5,000 each. Sponsored by the School Sisters of Notre Dame, the Caroline Center is an East Baltimore education center for women providing job readiness, specific trainings and academic and career advancement services. Catholic Charities is the largest private provider of human services in Maryland, with more than 80 programs serving people affected by poverty and homelessness; senior citizens; individuals with intellectual disabilities; immigrants; children and families. Cristo Rey Jesuit High School is a coeducational high school in Baltimore with a 100-percent college acceptance rate. Also receiving a $5,000 grant was The Samaritan Women, a national organization dedicated to ending modern-day human trafficking and caring or survivors of the practice. The Baltimore-based Christian organization counts Catholics among its ranks. The grants – which had to be matched one-to-one – were bestowed through Chesapeake Employers’ Bridge to the Future program, which had originally committed to awarding $100,000 in grants but raised that to $115,000 due to the number of qualified applicants. Chesapeake Employers has also committed to awarding an additional $24,000 to 45 runners-up of the Bridge to the Future grant program.